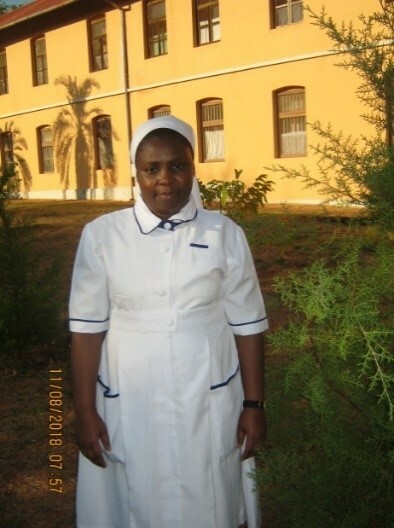 Ndanda School of nursing started in 1930 by our late Sr. Dr. Tekla Stinnesbeck OSB. During the 2nd world war, the school was closed and opened again in 1945. Since then the school was managed by our sisters till 2001 where by Sr. Beate Schroeter retired and the lay people took over. The school is under hospital management which is managed by Benedictine Brothers of Ndanda Abbey. I was given a new assignment to teach student nurses in Ndanda School of nursing November 22nd, 2017. We have 103 students (pre-services) fresh from secondary school, 40 of them are female student nurses and 63 are male student nurses. All are on-campus. We face a big challenge concerning the hostel, because we have only one stall building for girls and boys. they use the same door to go in. Female students reside second floor and male students first floor. There is a strict rule whereby no male student is allowed into the areas of female students, the same applies to female students. We also have 95 in-service Learning students, living off-Campus. These are enrolled (certificate) nurses upgrading to become Registered (Diploma) Nurses. Meanwhile we are nine (9) full time teachers. I teach Clinical nursing and nursing theories to the first year student nurses, Child health and leadership to the second year students. I am also responsible to make sure that everyone goes well to clinical area and practice according to their given objectives. I take care of the garden to make sure that students do get vegetables for meals. Once a year we send second year students to do field work in the villages. There they have to experience working with villagers and involve the community members in different health related activities, for the wellbeing of their health. This year in January we sent them in groups of five students to the seven villages. It is difficult to find a house to accommodate all of them. In one village, we were promised to get a room for all five male students, but when we arrived, there was no room for them. We were directed to go to the parish where our students will stay. The parish priest showed us the old Sacristy room where our students had to sleep. The door was not working, so students had to pass through the window to go in and out for four weeks. We were worried how will it work, but the students kept saying “it is Community field experience, things will work well”. Their words gave us courage to leave them and continue with our journey. We thank the Lord for His protection.